On Saturday, July 24, after Justin Thomas conceded a par putt to Jim Liu thus ensuring a 4 & 2 win for the 14-year-old Liu in the finals of the U.S. Junior Amateur at Egypt Valley, a remarkable week of golf ended. Although the USGA has conducted 29 previous championships in the state, this was the first time Grand Rapids and West Michigan have ever hosted an event. Being around competitive golf for most of my adult life, I knew these junior golfers were good but that’s a gross understatement. These young men were so talented and gifted it was daunting. Come on, 15-year-old Gavin Hall during stroke play fires a tournament and course record of 62, ten under par which included one bogey at Egypt Valley! And Egypt Valley is one of the area’s most demanding layouts (course rating 74.9; slope rating 143), an Art Hills design that can expose and exploit any chink in a player’s armor. So, what’s going on with these juniors? One, the circuit for junior golfers is sophisticated, highly competitive and teeming with talent. On top of many fine state junior tournaments, there’s a whole other strata of national events that beckon the best players from around the country. For example, the American Junior Golf Association (AJGA) is a powerhouse tournament organization (with 58 full-time staff!) that will run 85 top shelf events this year attracting the best junior golfers to its well-run and handsomely supported events. 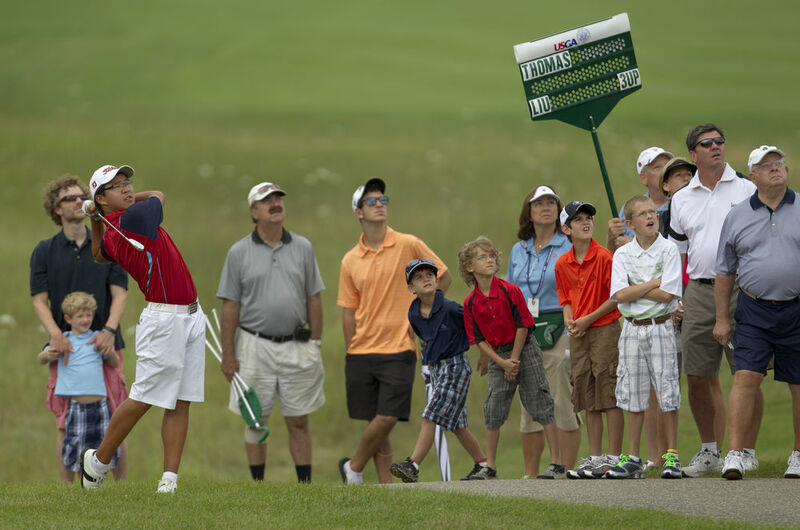 (AJGA logos and bag tags were prevalent at Egypt Valley last week.) Such keen competitive outlets, a la AAU basketball and travel hockey teams, greatly accelerate the learning curve for its participants. The truism of improving by playing against better players holds true in the junior golf ranks. Second, it’s obvious these juniors are supported by top notch instruction and custom-fitted equipment. Video swing analysis combined with the watchful eye and guidance of knowledgeable PGA instructors also has contributed to the excellence seen at the Junior Am. You just don’t see many “homemade” or unorthodox swings at this level. Generally speaking, modern swing fundamentals prevail. Then there’s the matter of golf aspirations. These kids are success-oriented more so than in previous generations. With supportive and self-sacrificing parents behind them, these elite junior players are also excelling because they have ambitious goals, including playing for some of the best colleges and universities. Not coincidentally, the NCAA golf coaches association holds a summer conference in conjunction with the U.S. Junior Am. As a result, the gallery at Egypt Valley early last week was heavily sprinkled with coaches boasting their school’s colors and logos. For them, it was a convenient, quasi-recruiting or “relationship building” opportunity to see these young golfing mavens. And so, young players, their parents and coaches were all in step dancing to the same college fight songs heard over the horizon. But do all those factors really explain someone like 14-year-old Liu of Smithtown, NY, the youngest champion in the history of the 63-year-old U.S. Junior Am? 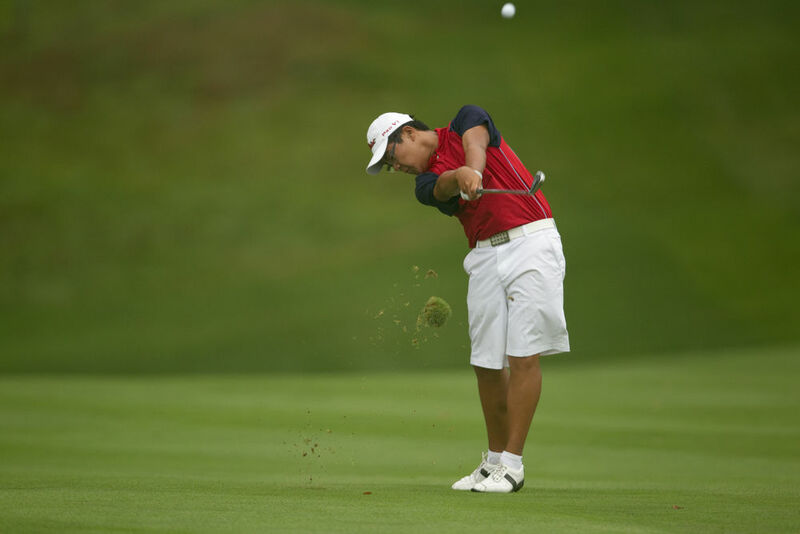 Well, Liu started playing competitively at age 6 and won his first national event the same year at the U.S. Kids World Championship. He went on to become a four-time U.S. Kids World champion and at age 9 he carded a 59 in a sanctioned junior event at Lake Buena Vista, FL at DisneyWorld. And he regularly plays in the older age groups in these events, thereby honing his competitive skills even sharper. Besides counting his father as his major golf influencer, Liu also boasts the same coach and teacher Tiger Woods once had as a teen, 89-year-old John Anselmo of Long Beach, CA. And some reports indicate Liu aspires to play at Stanford, following in Tiger’s footsteps. Yes, I guess it all adds up for producing sensational golf. But it sure was an unexpected and delightful surprise. Postscript: Kudos to Egypt Valley, its tournament committee, and its members for all of its efforts in hosting the Junior Amateur. For a club that was beset in recent years by personnel and financial turmoil resulting in negative publicity, the Junior Amateur became a rallying flag in a fresh breeze. In the championship final match when eventual runner-up Thomas magnificently drove the par-four 4th hole, his shot soaring past a pond and over the greenside bunker, it was a moment that encapsulated a memorable week of uplifting and restorative golf. Note: Images courtesy of the U.S.G.A.